YOU WILL NEVER WANT TO LEAVE THIS MAGNIFICENT PROPERTY AND WHY WOULD YOU? IT HAS IT ALL. 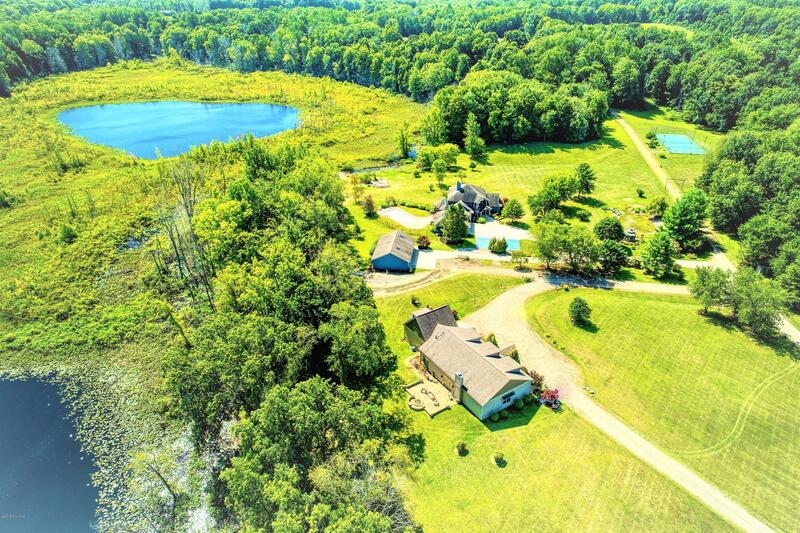 81 RARE ACRES with your own stocked private lake, woods, trails, hiking or snowmobiling. Breath-taking views surround you with peace and tranquility. As you enter the property through your own private gate, 8, 000 + of living space awaits you.The custom architecturally designed home features great views, 6 bedrooms, 5 baths, 2 great rooms, movie theater, game room, a kitchenette & a fabulous main level kitchen. Outside, enjoy the in-ground heated pool, 3 season room, tennis court, huge pole barn and the basketball court. Lounge around on the patios or decks and watch the birds above, the wildlife around, and the water below. "Click More" for more details of this fascinating estate. The Lodge with over 2,900 square feet has a full kitchen to entertain your guests in style. Large open main level space, an office, and an upstairs living room for even more entertaining. In addition, there is an utility building with hot and cold water that can be used to store your cars and toys. Located in the heart of wine country, close to Lake Michigan and Notre Dame, and only 11/2 hours from Chicago this magnificent setting is unlike any other in the Midwest. Click the "Documents" to make sure you find the Custom Sheets all of the beautiful customary that went into making this house a home!! !